TSN: Bob McKenzie reports Montreal Canadiens general manager Marc Bergevin has let his 31 general manager colleagues know that he is available for business in terms of potentially trading a forward. 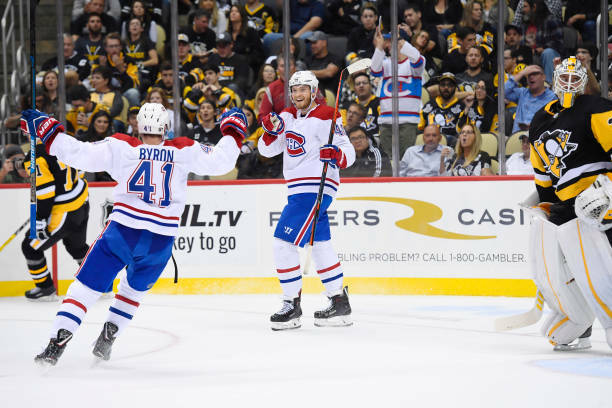 On any given night, Nikita Scherbak and Tomas Plekanec have been healthy scratches sitting in the press box and with Nick Deslauriers soon expected to come back off injury as well as Jacob de la Rose, the Canadiens could have 16 healthy forwards. Somebody could go down on waivers, but they may also lose somebody for nothing, so Marc Bergevin is being a little preemptive here and saying, hey, if you want to talk about one of my forwards, give me a call. TSN: Pierre LeBrun reports it is still not very close is what we’re being told and you wonder how it got here. For one, both sides have not really moved from their opening position, I think the Toronto Maple Leafs opened around 6×6 ($6 million a year for six years) and we know the William Nylander camp was over $8 million a year, so a big gap there. If a team were to offer sheet Nylander between a salary of $6,088,981 – $8,118,641/year, the compensation is a 2019 1st, 2nd, 3rd round pick. These are the only teams that could offer Nylander an offer sheet: Arizona Coyotes, Boston Bruins, Carolina Hurricanes, Colorado Avalanche, Dallas Stars, Detroit Red Wings, Edmonton Oilers, LA Kings, Minnesota Wild, Montreal Canadiens, New York Rangers, Philadelphia Flyers, Vancouver Canucks, Vegas Golden Knights and the Washington Capitals.